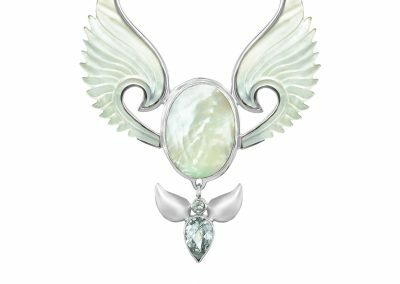 Ultimate Guide to Angel Pendants and How Angel Pendants Work. 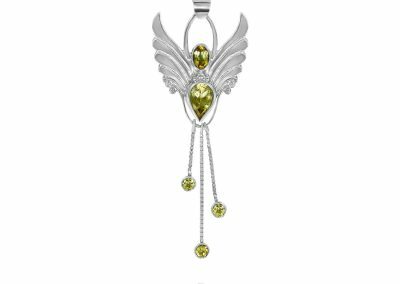 Hello and welcome to the fascinating world of Angels, my Angel pendants, and what they can do for you. 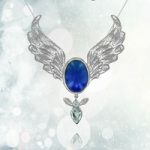 In addition you’ll find instructions on how to cleanse the energy of your angel pendant, how to choose the angel pendant that’s just right for you, and generally how you can most benefit from wearing your angel. #1. 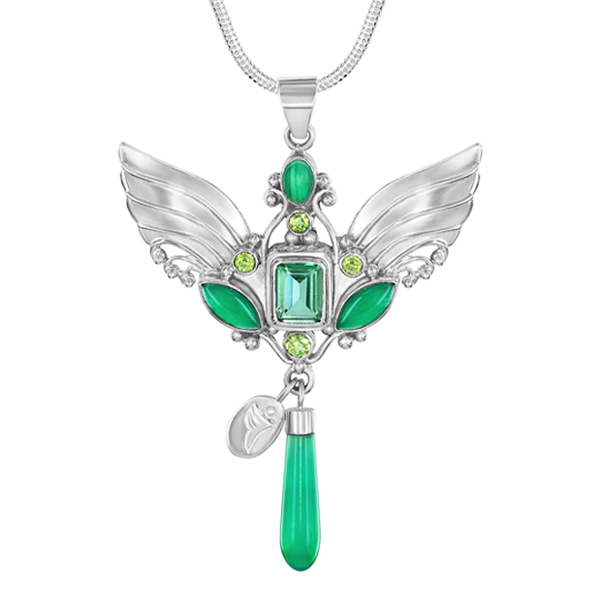 How To Choose Your Angel Pendant. #2. How To Activate Your Angel Pendant. #3. 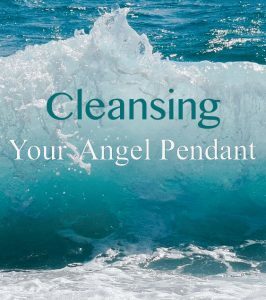 How To Cleanse Your Angel Pendant. #4. How To Use Your Angel Pendant For Manifesting. #5. 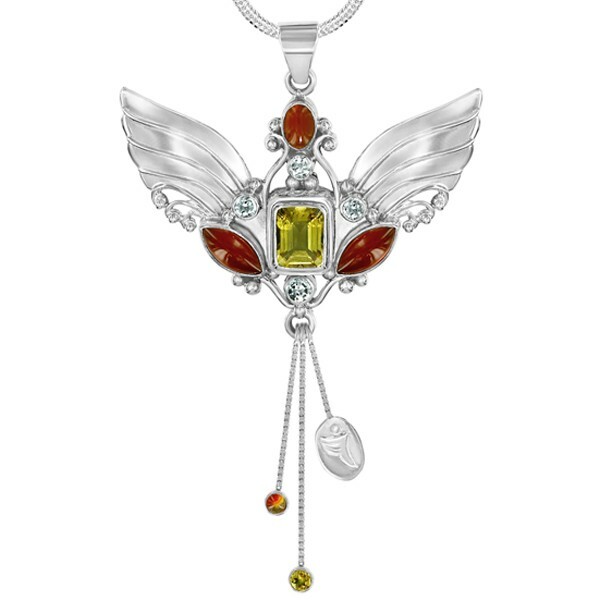 Why People Like To Wear An Angel Pendant. #6. Therapeutic Value Of Wearing Your Angel Pendant. 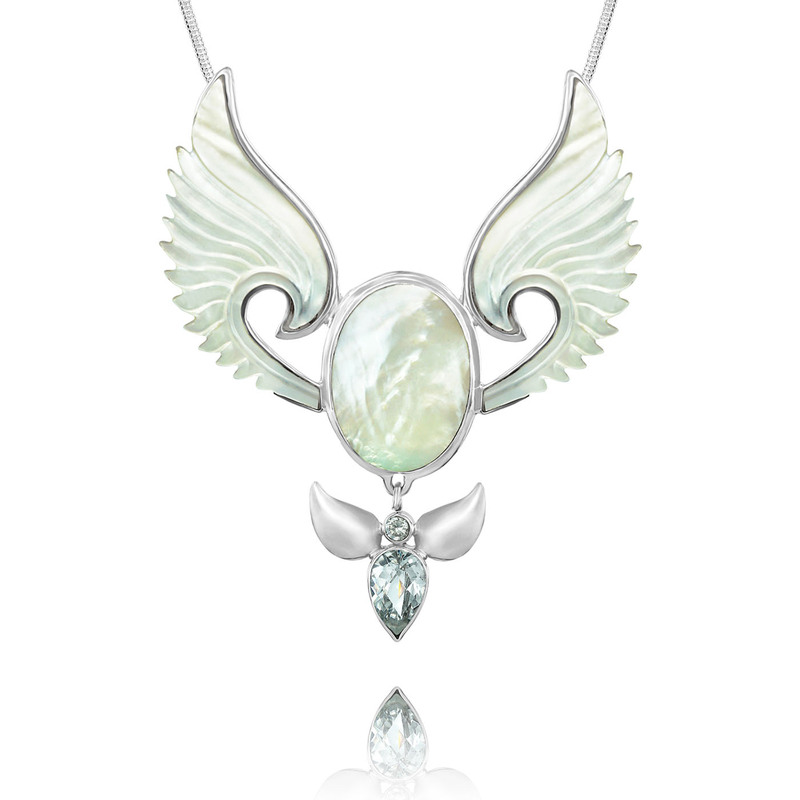 Here at Angel Jewellery I not only offer you a high vibrational, high quality and beautifully made piece of jewellery but I also want to be of service to you, the light workers, healers, artists and therapists whose incredible work is helping us live happier, healthier, longer and more abundant lives. It is my purpose and joy to combine the physical and energetic components of each Angel in a such a way that when you wear your Angel Pendant you will immediately experience a deeper and more profound sense of interaction with your Angel and find the extra support you need for your own personal journey. 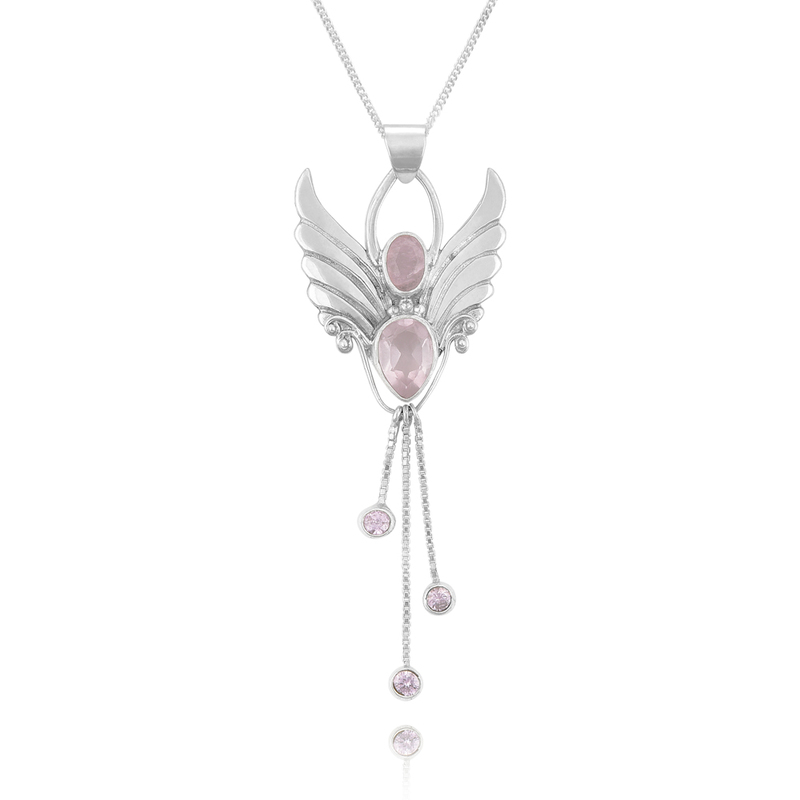 Transforming our lives is not easy and my Angel Pendants are not supposed to offer you a complete answer in themselves, but wearing a symbolic piece of carefully made Angel jewellery, an object that always sends out a positive affirmation about our goals, needs, and desires is one more beautiful way we support ourselves in our work of transformation. It will constantly inform the universe and the angelic realms of our mission, and what we want to do with our lives. It’s a fact dear one, that when you wear Angel Pendants you are more likely to be open to their messages, feel safe and protected, quietly comforted and less confronted by this world. Furthermore, there is a special Angel assigned to help you achieve each specific goal and desire you will ever have. 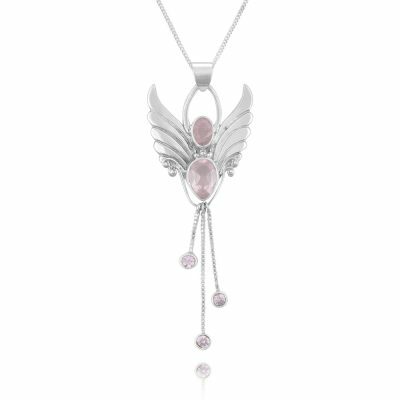 I expect you’ve had a quick look around my website and seen some very nice jewellery, but how do you choose the perfect Angel Pendant for you? From the huge selection available you’d think this would be an easy task but its not. You begin to think you need them ALL! Angels are delivering messages, accompanying the lonely, granting protection, and even fighting your battles for you, so which one do you need? You may be buying one for your partner or friend, and you are even more unsure about choosing the right one. If you are lucky your partner may have dropped a hint, or even given you details of the Angel she wants. Thats what I am going to help you with, and it’s not so difficult when you follow these few simple tips I’m about to give you. 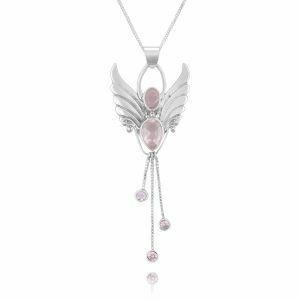 My advice to you is keep it simple, follow these foolproof tips on how to choose the perfect Angel Pendant and you will make the right choice. This is a great way of choosing the perfect Angel. 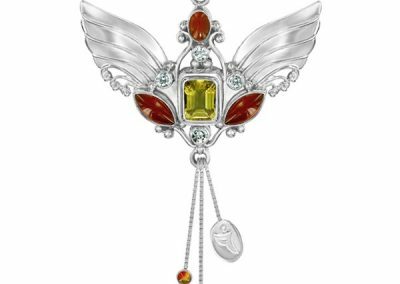 In this section you will see that the Angel Pendants are all assigned to specific months of the year, and each month has one or two Angels to choose from. Look for the Angels appointed to your Birthday Month and click through to read a little more about those Angels. 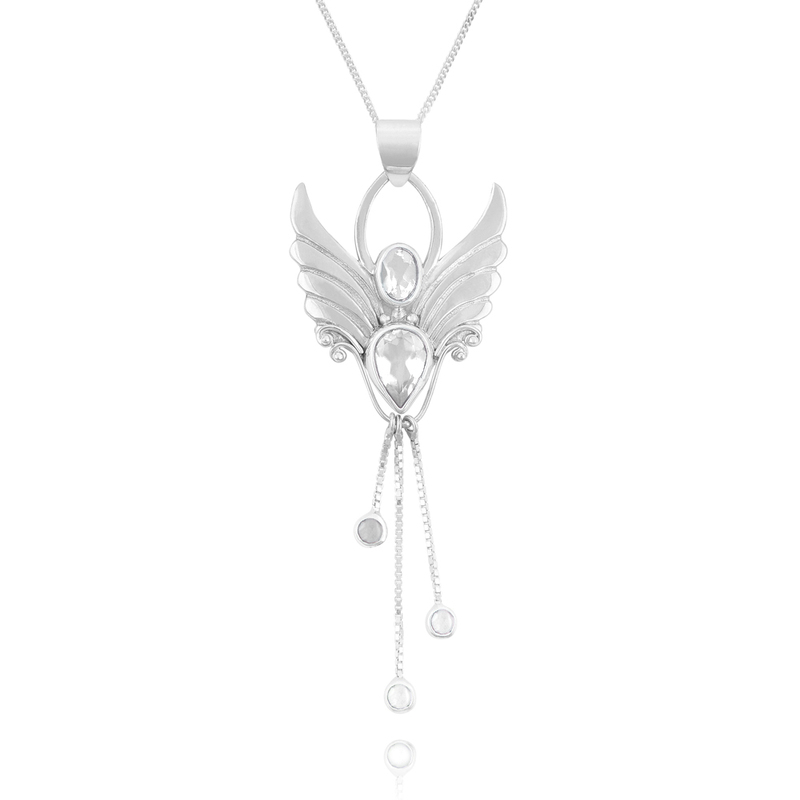 Choose An Angel Pendant To Help You With A Challenging Task. Angels were created to help you. Need more confidence or self-esteem for instance? Let’s say you’ve been trying to build up your self-esteem lately but you’re still running into situations where you don’t feel up to par. This Angel will help you to make some progress in the area of self-belief and self-worth. 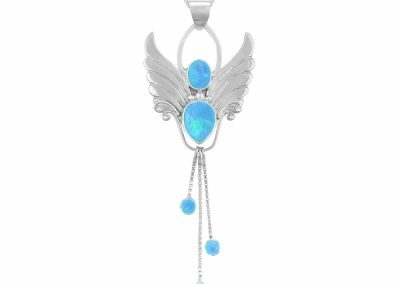 Wearing this Angel Pendant will help you to feel loveable and supported right away because it is this Angel’s express wish that you love and esteem yourself and she will do all she can to support you in leaning how to do this. Every time you reach up and touch your Angel pendant, you know your Angel is right beside you, filling you with positive, self affirming thoughts while you are learning to develop these qualities. Choose this Angel Pendant to wear if you are working with your inner child, developing self-esteem, self-love, or your femininity and also to heal the heartache of loss. Angels love you, and they will gently and gradually inspire you to realise how worthy and beautiful you truly are. This Angel’s job is to help the whole of humanity to realise their true self worth, and that includes you! There are 12 Angel Pendants to choose from, and each one is correctly attuned to help you develop and manifest your desired outcome. There’s an Angel to help you remove money blocks and attract abundance, there’s a relationship Angel to help you attract a soul mate or renew passion in your relationship, there’s one to help you boost your energy or even to help you stick to a diet, and yet another to watch over you, to protect you and keep you and your loved ones safe. Here are a few you might like to check out, but take your time, and I’m sure you’ll be guided to your very own, perfect Angel. Choose For Help With Your Dream, Hope, Ambition or Desire. 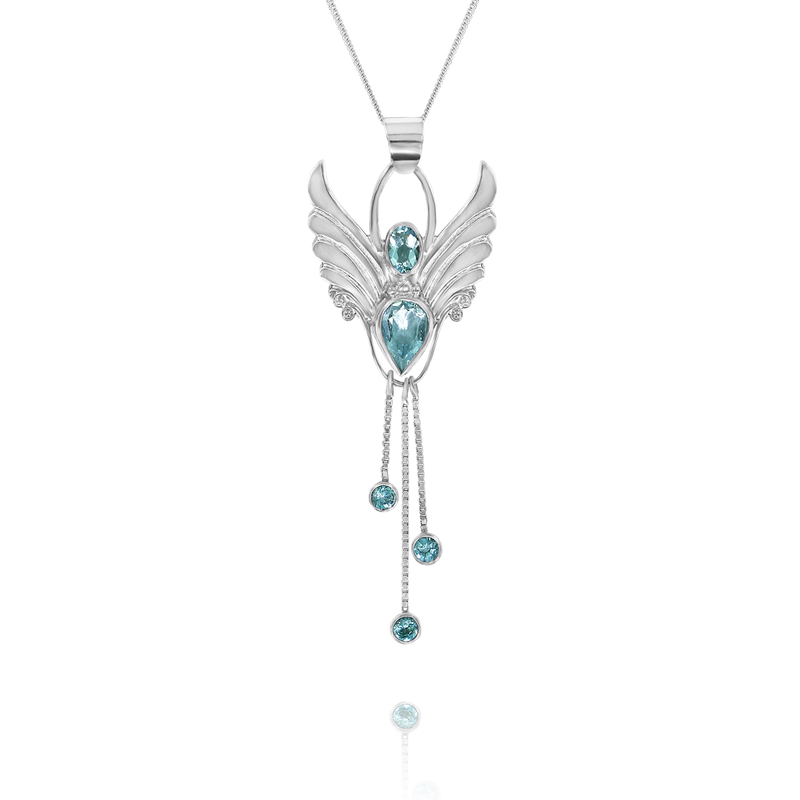 So you see that when you purchase an Angel Necklace you can be quite intentional in your choice. I’ve been guided to use gemstones in my Angel Jewellery because gemstones hold very strong vibrations and energy frequencies that offer specific help with your dreams, ambitions and hopes. Every one of my Angel Pendants provide you with exactly the right formula to manifest your unique chosen outcome. For instance this Angel Pendant carries the gemstone Amethyst, which is the birthstone for those born in February. This will be a healing and guiding Angel for you if you suffer from stress or find it hard to meditate and it is the birth month Angel for those born in February. There are Angels appointed to help us with each and every task we set out to accomplish. 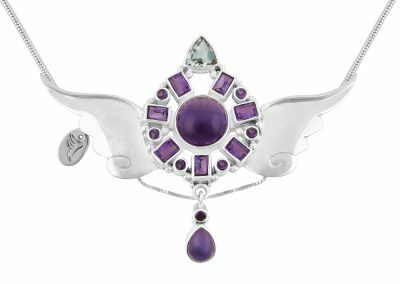 The Amethyst Angel has a very calming effect on the mind, making her the perfect Angel Pendant to wear if you have a history of anxiety, or while we are studying for instance, and need an extra boost of concentration. She steadies our mind with her calmness and helps our brain to memorise and recall facts and figures. When we are practicing meditation she is especially helpful in calming the ego brain which always tries to distract us with thoughts. This Angel is a great friend to those who are a little impulsive and get themselves into trouble by over reacting or acting impulsively and then regretting it. She helps us to think before we act. 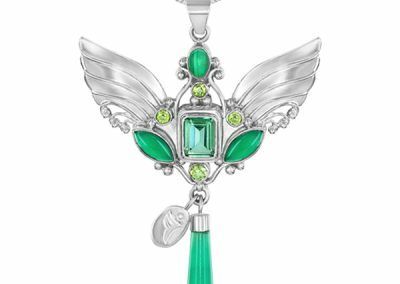 So you see, there is an Angel Pendant to bring your deepest desires to fulfilment or a sense of calm to your current anxieties, just come over here and trust the Angel you need will find you. Let it be that easy. Why do I need to activate my Angel Pendants? There are hundreds of thousands of Angels to help us achieve anything and everything we could ever want. Remember, God gave every single one of his Angels a specific task so they could help humanity in an infinite number of ways. Your Angel would like to help you with your particular needs, so once you have chosen her it’s time to talk to her about your needs so she has a clear idea of what she is here to do. Follow this easy, 6 part activation ritual. This is a lovely little ceremony you can do right away to build a relationship between you and your Angel. You will need a pen and paper, a candle and your Angel pendant. Reserve 15 minutes quiet time for yourself, somewhere you won’t be disturbed. Put your phone on silent, light a candle and dedicate the light to the wonderful relationship you are now going to have with your Angel. Sit comfortably, holding your Angel pendant in the open palm of your dominant hand, with your other hand supporting it underneath. 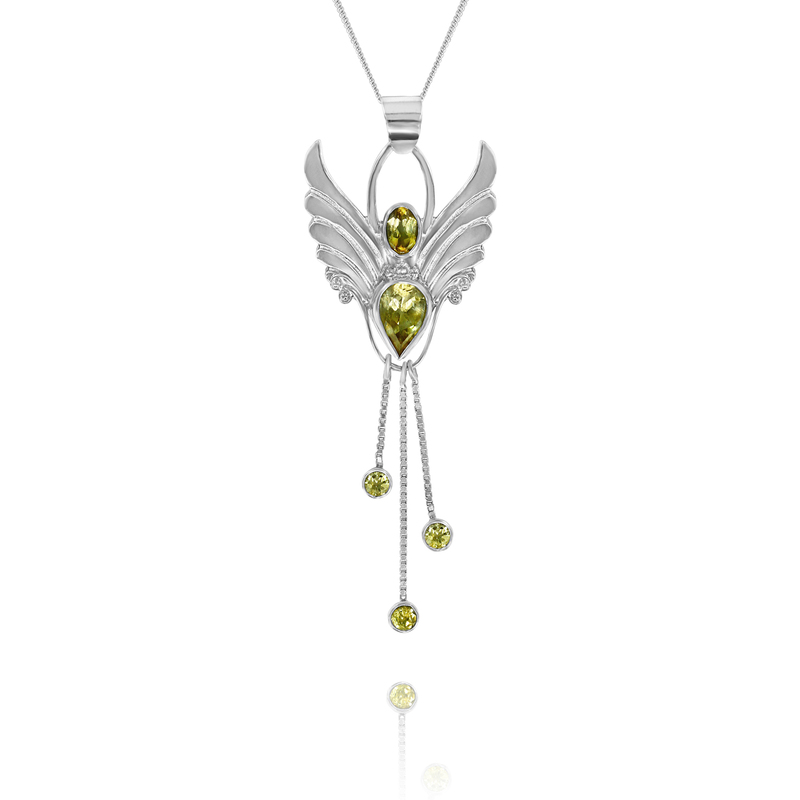 Sit a safe distance away from the candle but close enough so that the light falls onto your Angel Pendant. When you are comfortable, relax and release all tension. Take one nice deep breath, then 3 more breaths, each one becoming a little slower and a little deeper than the last. 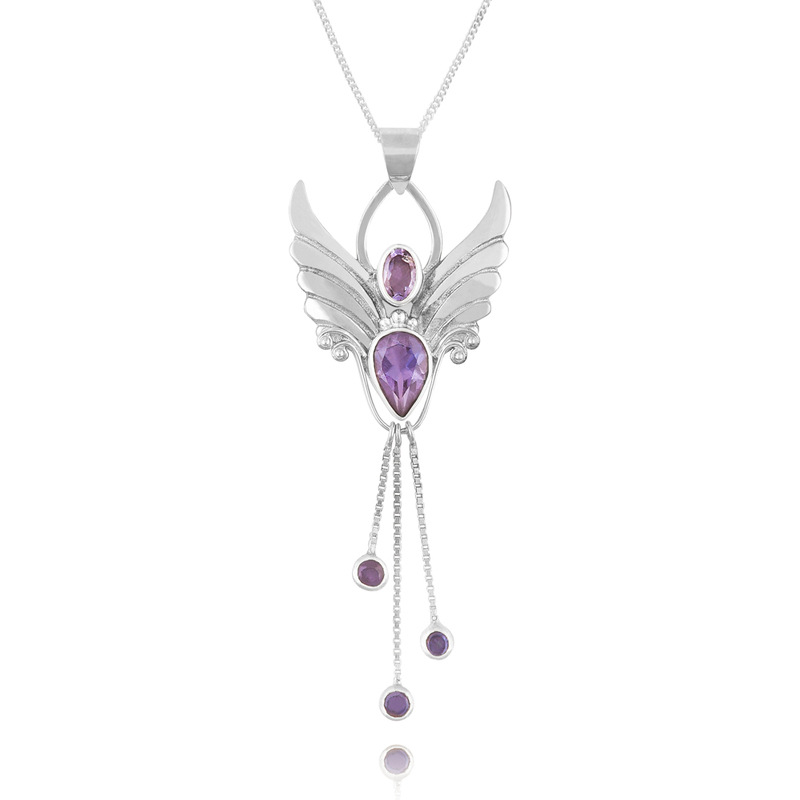 When you have clarified your intention put your Angel Pendant to one side and write down your exact goal or intention. Include how you will feel when you have achieved it. Pick up your Angel pendant again and hold her in your hands like before, letting the light of the candle fall upon her. Speak to her quietly about the goal or intention you have written down, keeping your conversation specifically on this subject for the next few minutes. Also, speak to her about the outcome of your goal and how you are going to feel when it is accomplished. Now say a short prayer of gratitude, thanking your Angel in advance for her help. Know that from now on she will always be with you to guide you and help you manifest your desired outcome..
Gently put your Angel Pendant on and hold your hands over her for a moment or two and take a couple of deep breaths. Blow out the candle and dedicate the light to the wonderful relationship you have now established with your Angel. You two are now a team of considerable influence. 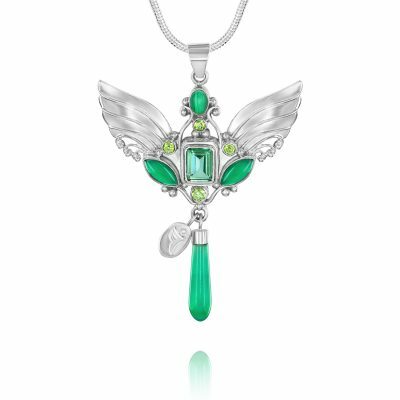 Congratulations, you have now activated your Angel Pendant. The crystals and the Angel will provide your energy field with constant support, and now that you’ve placed your intention in the loving hands of your beautiful Angel there is nothing more you have to do. 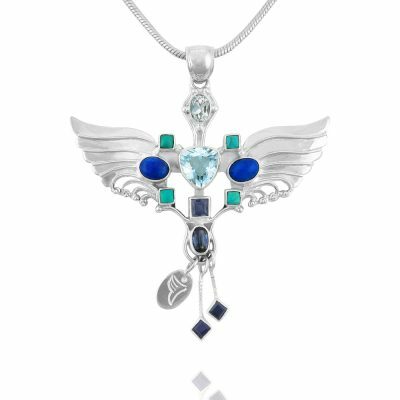 Along with the power of her crystalline frequencies and symbolic components, your Angel necklace is now ready to empower you. You have given your Angel a purpose, an assignment, a course to steer you and keep you focused upon. You two are now a team, remember to say “thank you” very day. Once she has helped you with this task you can give her a different one – just go through this same process to set your new intention with her. 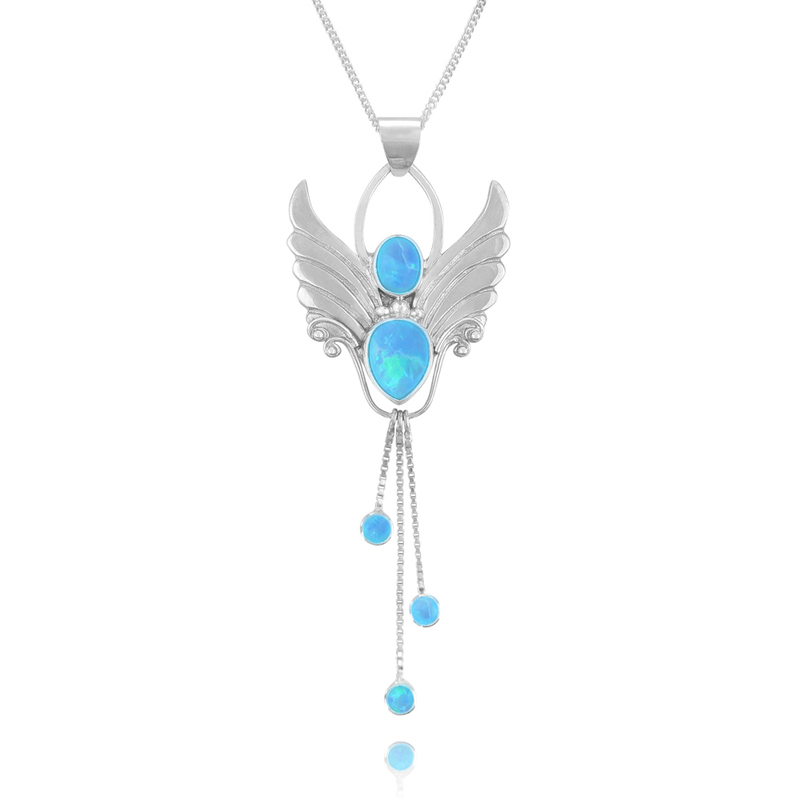 I choose exactly the right gemstone (or combination of gemstones) so that your Angel pendants will have double the potency to produce the particular goal or outcome you want to achieve and each Angel necklace provides you with exactly the right formula with which to manifest your intended outcome. There is a “Study” Angel, a “Peace” Angel, a “Confidence” Angel, in fact, an Angel to assist you with almost every intention, dream or aspiration you work towards. 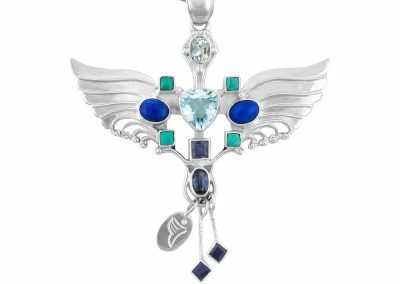 Some Angel pendant types you can browse. Cleansing your Angel Pendant can be achieved in several different ways and I will also let you into a little secret to keep your Angel looking its best. 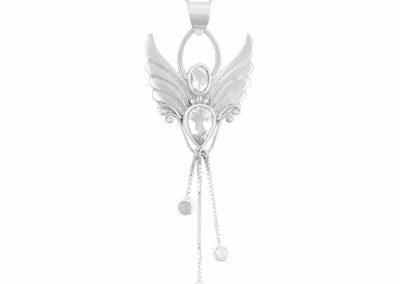 Your Angel Pendant is made of silver and silver is a versatile, semi-precious metal with a soft luster that makes for beautiful jewelry. We use a lot of gemstones in our jewellery too, so It can be a bit intimidating if you want to clean your Angel Jewellery because it seems so delicate. However, you don’t have to be a professional or use expensive cleaning products to safely clean your Angel Jewellery by yourself. The safest way is to rinse it under cool running water and gently rub the silver and around the gemstones with a very soft toothbrush and hand soap. Be sure to clean off any residue, rinsing off the soap completely. Dry it completely using a soft cloth so there is no moisture on the surface of the jewellery. I like to wrap it in a soft Kleenex tissue afterwards so that any remaining moisture is absorbed by the tissue. Now you can use a special silver polishing cloth or simply a soft, lint-free cloth to gently rub the silver clean after washing and drying. Make sure it gets completely dry. Silver can be so soft that even using a scratchy, rough towel could be enough to make indentations in its surface. As you gently buff your jewellery you will see the radiant shine return. Tips for cleansing your Angel Jewellery and keeping it safe. All sterling silver will tarnish over time, but it will happen much faster if it comes into contact with agents such as perfume, salty air, sulphur, skin creams, hairspray, chlorine and acidic skin ph. The amount of tarnishing (oxidation) that occurs really does depend on your care habits. Because of this I wipe my jewellery with a soft cloth after wear, and store it carefully away from heat, damp and light. This is a sure way to keep it looking it gorgeous and lustrous forever. We also recommend that you do not wear your jewellery whilst bathing, whilst in bed or during sporting activities. Having said that many of my customers report to me that they have worn their Angel Pendant for 5 years solid without ever taking it off!! Cleansing your Angel Pendant in the Moonlight. To restore the radiance of the gemstones, place your jewellery on a windowsill where the gemstones will receive the rays of a full moon. Leave it exposed to the moon for an hour and this will re-charge the crystalline structure of the gemstones so their healing and protective properties will be amplified. This is the perfect time to activate your Angel Pendant so she can work to your best advantage. If you want instructions on how to do an activation ceremony with your Angel come over here. Cleansing Your Angel Pendant With Sage. From time to time cleanse your Angel Pendant of negative energy with white sage. We are all exposed to negative energy in a variety of different ways during our everyday lives and our everyday interactions with people. Cleansing your Angel Pendant with the following ceremony will release any negative energies which have attached to your Angel. Dank, unwanted energy is sometimes hard to shake off, especially if it comes from an attachment we’ve had to a person or a substance. It’s important to cleanse not only your Angel Pendant but also yourself and your living space so the energies of love and light reign supreme. Cleanse everything in 4 easy steps. Sun dried white ceremonial sage has a distinctly beautiful scent when burned. You can purchase it from many whole food stores, and if you’re new to this practice, just try to be open to all the benefits. Put your necklace on and make sure it is firmly around your neck on the outside of your clothing. Place your sage bundle in a fireproof dish then light your sage bundle by holding a flame to it until it begins to smoke. If a true flame appears, shake the bundle gently or blow until it is just embers and smoke. Once you have a nice smoke going, use you hand or a feather to direct the smoke over your body from your feet up to your head, then back down again. Repeat a few times and as you do this, visualize the smoke taking away any negative energies from your Angel Pendant, your life and your home. You can also visualise the smoke taking away any unwanted energies from your loved ones and even pets who live with you in your home. Once you have completed the cleansing let the sage bundle to either burn out or gently press it out in your heat-proof dish or container. 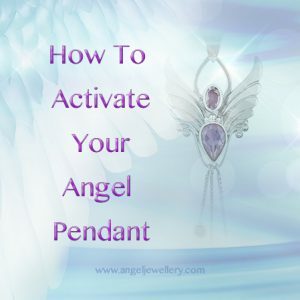 Have fun wearing your lovely cleansed Angel Pendant and don’t forget to come over here to see our instructions on how to activate and dedicate your Angel Pendant so she can help you with your goals whatever they may be. Just like moments after your conception, when cells began to divide and each cell knew wether it was going to be an organ, or a bone or an eye, your spirit and your Angels knew that your life had a divine purpose too. Angels work on many levels and can be called upon to help us in hundreds of different ways and one of the many jobs my Angel pendants do is to help you to focus your attention, set your intention and receive intuitive guidance from them to manifest your goals. You might be feeling unsure about your abilities to receive guidance from your Angels, after all how do you know where the guidance is coming from?. Is it just your own thoughts or is it really guidance from the Angelic realms? First most valuable step in manifesting with your Angel Pendant is to get clear on what you really want and what you want to manifest in your life. Having clarity is an important step to manifesting your dreams, ambitions and goals. “Ask and you shall receive”, but be careful what you ask for because manifesting really works. If you are unsure of what your goal is, think about making a visions board. Look through magazines and cut out any pictures that really grab your attention. Then glue them onto a large sheet of card or paper. Do this while you listen to your favourite music, or better still get a group of friends to come to your place and make a visions boards together over tea and biscuits and chit chat. When you’ve finished really study the board as a whole..see its different components..which parts inspire you? Ask yourself what you like most about the picture you’ve created. It can bring out hidden clues about directions you’d like to go with your life. Keep it light hearted and fun and the Angels will be listening for ways to help you. Meditation is also a great tool for getting clarity. Make a point of meditating for 15 – 20mins every day for a week. Answers may not come during the meditation but sometime during the day or in the next few days you will get clarity and inspiration as your mind becomes less cluttered. If you are pretty sure of your goals and what you’d like to manifest you’ll find guidance here on how to keep your inner vision clear, like a beautiful blue lagoon, to ensure that your wishes and dreams have the best possible chance of manifesting with the help from your Angels and your Pendant. When you were a small child you may have had a dream of becoming an Astronaut, a Poet or a Ballerina perhaps, but you resigned yourself to becoming something that your teacher told you was more “practical”. Rather than going after your dreams you settled for something more acceptable, logical, something that others would be more comfortable with. What you really wanted began fade along with the wholeness of who you really were. As your dreams became smaller you became discouraged and even depressed. You essentially stiffled your dreams, became wary of talking about your desires, and eventually abandoned them. But the more we lose sight of our true magnificence, the more we grow into people we are not happy being because discontent turned inwards eventually becomes depression or even physical symptoms. Globally this results in many unhappy people expressing their discontent in the form of anger and violence. This is a critical time in history; a time when we all need to shine our greatest light and manifest our biggest dreams, not shrink into denial and fear. Thats what fear wants, it causes the deepest part of you to shut down until you almost completely forget who you really are..
..but your Angels did not forget! Angels Help Us To Re – Member & Manifest Our Dreams. When we finally start to live and speak our true feelings and desires we show up for ourselves in a big way. Our lives and the lives of those around us are enhanced. Besides that, our Angels see us, and recognise us as the person they know we are, wise, worthy, intelligent and divine. When we stand up and show up for ourselves the Angels and the universe respond by saying “yes” to our dreams. They both know what our purpose truly is ..it’s a match made in heaven. 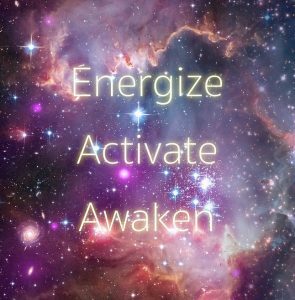 To begin, lets look at Intention and Attention because you will need both of these for the manifesting process. Intention – Having the mind fixed upon something. Having a purpose, to stretch towards, or to lean towards. Attention – The Active direction of the mind upon some object or topic, consideration, attentiveness, power of mental concentration. How To Seek The Angels Assistance When Manifesting. Here are some ways you can seek the assistance from your Angels when manifesting. New moons are the perfect time to plant the seeds of your manifestations. 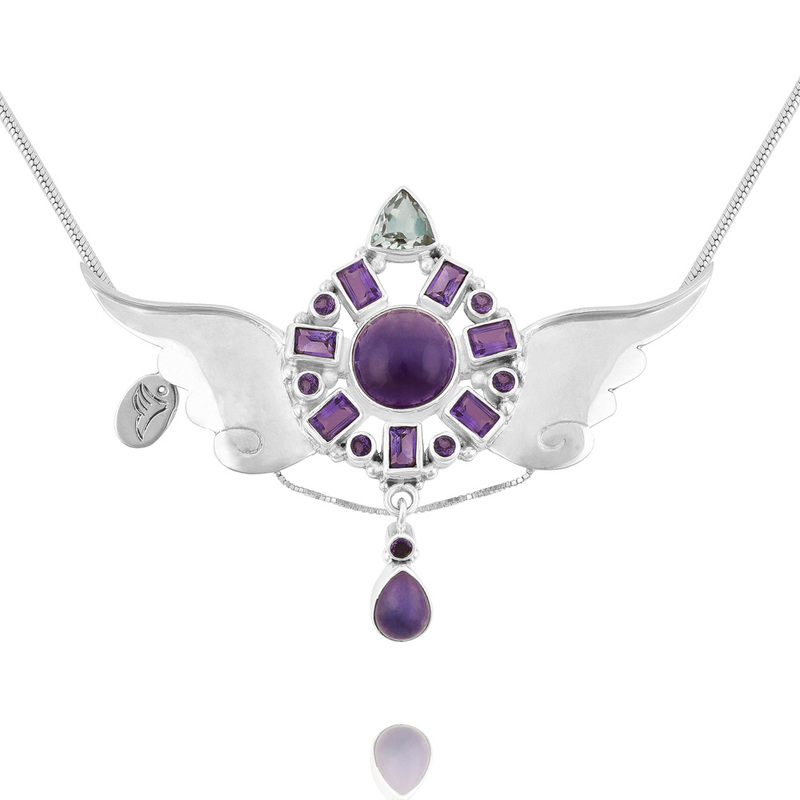 Create a ritual around the new moon where you set your intentions with your Angel Pendant. You might like to come over here for instructions on how to perform a new moon manifestation ritual. You will have extra support from the energies of the Universe during the new moon, and during the full moon you’ll be supported in receiving the manifestations that you set during the new moon. Using Angel Cards to Aid Manifesting. Angel cards are a great way to tap into your inner wisdom and receive support from the angelic realm. You are always connected to the wisdom and intelligence of the universe but sometimes you can lose confidence and block messages from your spiritual self. Use angel card decks as a way of tapping into your intuition, inspiration and creative powers. There are lots of beautiful Angel card deck to choose from and I would suggest that take a look at these listed here. I use all of these and can personally guarantee the quality and excellence of these decks. Meditation For Manifesting With Your Angel Pendant. To my mind there is no better way to clear any unnecessary mental distraction than 15 – 20 mins. meditation. When setting an intention, or focusing your attention on a particular goal it is always a good idea to begin with some quiet time with yourself to step away from the busyness ad distractions of everyday life. What the children are going to wear tomorrow or that call you need to make to the mortgage company all distract you from your task, which is to reach a feeling of quiet stillness. It may seem a boring place to hang out, all by yourself just sitting there, but you will feel the benefits afterwards, when you go into your manifesting ritual with more attention and focus. For thousands of years people throughout the world have worn items which hold a sacred meaning for them and their community. It is a very natural and a beautiful practice which science now recognises as a way we humans have found to empower our subconscious mind to transform our lives and attain uplifting and positive results. Things like crystals, the holy symbol of the cross, angels or holy medals representing a favourite saint, things which are considered beneficial for protection and empowerment have been proved to work, we have only to remember the placebo effect for evidence of this. The fact of the matter is that for thousands of years people have found that by wearing such jewellery there have been positive changes in their lives. Because Angels Are A Universal Language Of Love. The actual science behind this is what Einstein called the power of collective knowledge, or collective consciousness. The fact that almost every culture on earth associates an Angel with the highest qualities of love, support, protection and the ability to commune with the divine, when wearing an Angel Pendant we automatically tap into a belief, or an energy system which holds the collective vibration of love and light which is what Angels actually are; and this is how they help us to connect and experience the higher consciousness of love, peace and divine connection. Angels speak of love and comfort throughout time to all humanity and will help and support you to expand your consciousness in ways that will bring you into alignment with your life’s purpose and your greatest good. 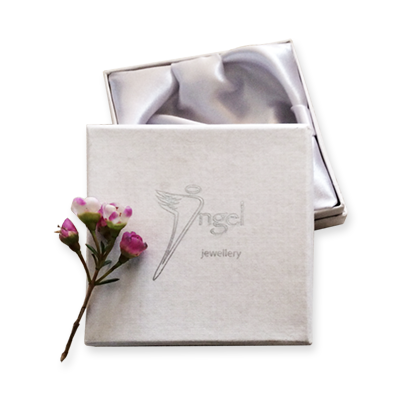 Because we know this to be the purpose of Angels I am delighted and honoured to be a channel for their guidance, to deliver their messages and support you in the form of beautiful angel jewellery..
Angels are creations of the highest, most pure energy. The purpose of their creation was to be of service to this most pure energy by assisting the myriads of it’s manifestations to be in alignment with the creator’s intention for them. Thats why we say that everything has an Angel. From the unborn baby or the smallest flower, to each heavenly orb in the cosmos an Angel has been appointed for their protection and care. Angels speak of love and comfort throughout time to all humanity. When we are children the world is a very powerful place because we are always creating magical experiences with everyday things. We feel the excitement of the ocean waves, even though our ship is just a cardboard box. We believe, therefore we feel. As children we are truly creators defying the dogmas and so called laws of science yet as we grow up common magic gradually gives way to materialism. Mystic and Shaman traditions and even Christian traditions have long regarded that the simple act of coming into physical contact with any holy item will help create life enhancing blessings and benefits. Science, though it tries hard to hold onto what it calls it’s rational laws of materialism, is beginning to come around to this idea too. Even though it goes against the grain to fully support the idea that objects have power, research has now kindly provided substantial evidence that throws some areas of science into serious debate. Though our current scientific world view states that life has no actual purpose and that all matter is purely mechanical, we’ve got to remember that this dogma is comparatively new.. Along with this is a belief that memory and consciousness is in our our brain, that plants, animals, planets and stars have no consciousness, that we are the only beings with consciousness, and our thoughts and intentions have no power outside of ourselves. These commonly held scientific dogmas are simply beliefs that came about a little more than one hundred years ago and are now outdated and contested by the recent revelations of Quantum Mechanics. Quantum Mechanics has shown that particles of energy are not fixed to one particular place or form and do not obey the rules of the old mechanical world view as we have been led to believe.. Quantum physics has shown that when energy particles are observed by a human they behave like we expect particles to behave, yet when they are not observed, i.e. when a human is not watching, they behave in all kinds of different ways, sometimes like waves, sometimes like particles, and not only can they be both at the same time but they can be in different places at the same time as well. Particles actually change their form and are not consistent. In other words they behave according to the belief of the person who is looking at them. Some people even go as far as to say that matter would not exist at all if we were not here to observe and create it. This of course leads us to the laws of attraction, and leaves scientific materialism standing on it’s head. Eastern science and philosophy have been telling us this for thousands of years. One see’s the world as one expects to see it, or what one believes or thinks about consistently is how one experiences reality, i.e one creates reality by their thoughts and beliefs. In the eastern world view, even today many still practice ancient arts and healing modalities that require nothing but the intuitive movement of the healer’s hands inches above the patients body. Their science includes the medicinal use of plants, crystals, vibrations from musical notes, singing bowls, chanting and even a favourable position of the planets and stars to bring about a patients return to health, mentally as well as physically. Angels Speak A Language Older Than We First Believed. The story of Angels, of messengers from other realms bringing comfort, wisdom, and protection to us here on earth is a very old story indeed, taking us back to the earliest of civilisations which pre dates Judaism and Christianity by many thousands of years. This is the oldest evidence that Angels, winged messengers from another realm truly are deeply embedded in our collective consciousness and fundamentally connected to our development from as far back as history can now take us. Angels and Archangels occupy a natural and elemental place in our subconscious and because of this can do amazing things for those who ask for their help. Some claim the power of Angels depends entirely on the faith their owners place in them but I believe they do just as well when their owners are sceptical or even unaware of their purpose. My sincere wish is that wearing an Angel Pendant will help to nourish your dreams and your soul as you meet the challenges of life, will help you in the constant job of raising your consciousness, and living in the light, and that the Angels will re-connect you to your original power and support you and your loved ones to live an amazing life – in love and peace. Mention Angels and most people automatically think of those referred to in the Bible, or conjure up images of guardian Angels, yet a growing number will think of the healing powers of Angels, and the role they play in an ever increasing number of peoples lives. While Angel Therapy is a relatively new term, almost everyone is familiar with the notion of Angels, and this is an area of healing and spirituality that continues to grow annually. Seen traditionally as Gods messengers who provide a link between heaven and earth, Angels are viewed by many as providing comfort for those experiencing painful or difficult times, delivering messages of joy, healing and protection to those in need. 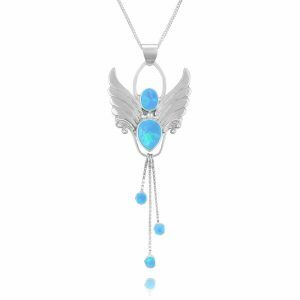 With this growing trend in Angels and Angel therapy, has come an increasing demand for angel inspired creations such as Angel Jewellery`s beautiful collection of silver and gemstone, and crystal pendants, as featured on the website. But have you ever wondered why we are drawn to wearing an Angel Pendant? You might like to come over here and read this. Wearing An Angel Pendant A Symbol Of Joy And Positivity. Have you ever noticed how much you play with your necklace? It’s remarkable to observe just how often one of our hands reach for it during the course of the day. 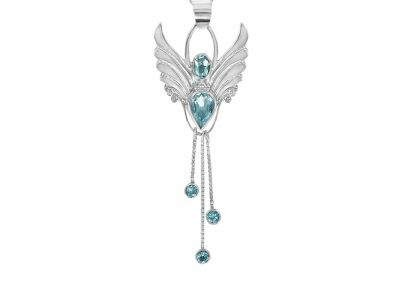 Wouldn’t it be wonderful to find an Angel Necklace there, as close as can be, just when you need help with a tense situation, or a little angelic inspiration. The Angel of joy and abundance will uplift the wearer’s mood because the Angel is in harmony with the energetic force of joy in the universe. Research is beginning to reveal that positive thinking is about much more than just being happy or displaying an upbeat attitude. Positive thoughts can actually create real value in your life and help you build skills that last much longer than a smile. In other words, when you are experiencing positive emotions like joy, contentment, and love, you will see more joy and experience more opportunities for happiness in your life. Positive emotions broaden your sense of possibility and open your mind up to more success on all levels. People who have acquired my Angel Pendants have found over and over again that there have been positive changes in their lives. You might like to find out what some people have told us in our Testimonials. 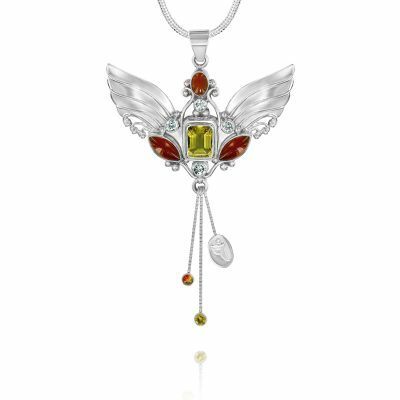 For an example, if you wear the Citrine Angel of Abundance for financial success, your subconscious mind will work towards this goal and bring financial opportunities your way, especially if you have attuned your angel, and confirmed your goals and needs with her as we have talked about previously. Angel Pendant for successful manifestation. 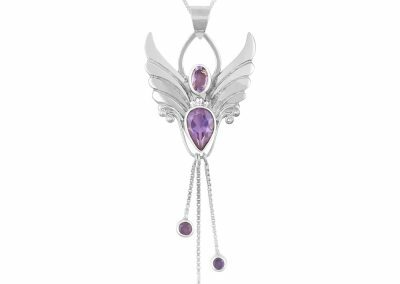 Archangel Zadkiel pendant for connection and emotional healing. 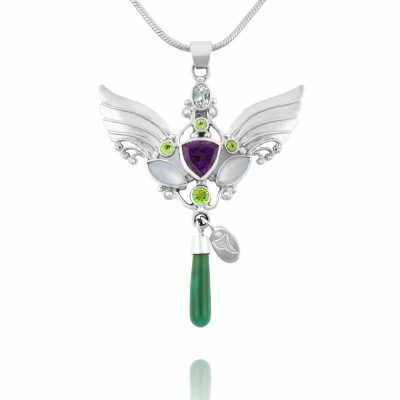 Archangel Raphael pendant for all those in the healing professions. 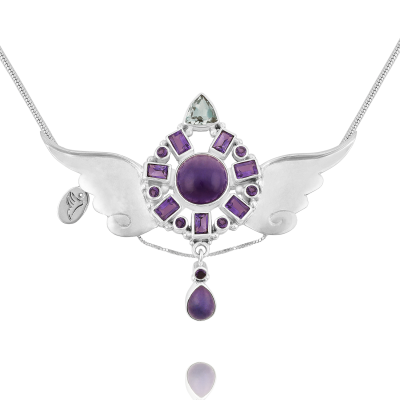 Angel of the divine feminine pendant for self nurture and femininity. Archangel Gabriel for angel messages and truth.